A Georgian TV station claims to have found a British fugitive that an international police hunt failed to track down. A screenshot of an interview of Jack Shepherd, an internationally wanted British fugitive, by Georgian TV station Rustavi2. Media appeared to have beat police to the punch in the hunt for a British man dubbed the “speedboat killer” by tabloids. The fugitive turned himself in to authorities in Georgia late on January 24 and is awaiting an extradition hearing. 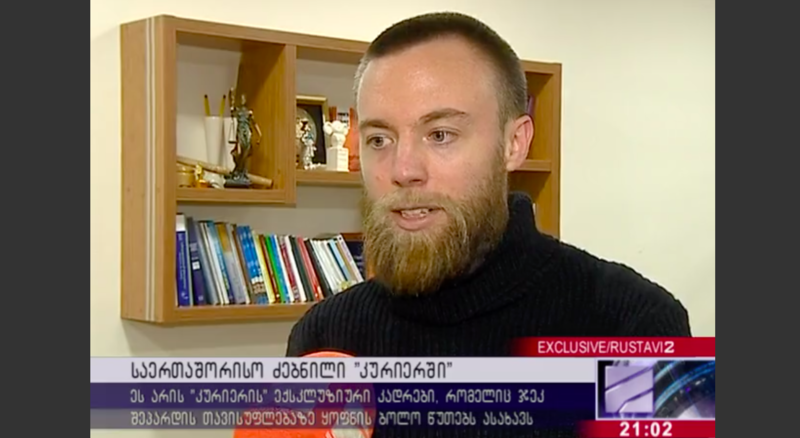 Georgia’s most popular television network, Rustavi2, says it was the first to track down runaway convict Jack Shepherd, who had been pursued for months by British journalists, Scotland Yard and Georgian police. The 31-year-old Shepherd was convicted of manslaughter after a female companion died in a 2015 speedboat accident on the Thames River. Shepherd became tabloid fodder following the accident, and even more so after he skipped bail in 2018. When the trail led to Georgia – based apparently on a tip from his wife – British journalists swarmed to the country in search for the fugitive. This reporter received several requests from British journalists to help with the search effort. The Georgian Interior Ministry declared that a massive search operation was underway, but critics charge that police did little since Shepherd appears to have been hiding in plain sight, regularly visiting bars and restaurants in Tbilisi. When he handed himself in, “Georgian police had to Google his case and find out what was this about,” Sky News reported. “I always wanted to visit Georgia,” he told Rustavi2, adding that Georgia was a cheap destination. His Georgian lawyer said that Shepherd had had friends in Tbilisi. Regardless of the circumstances, many Georgians enjoyed seeing their country featured in British press headlines, with some joking that the whole affair could be good for tourism, a key industry for the country. “Last time we made the front page of BBC it was over the war with Russia, so I say this is progress,” quipped one Facebook user. Others were miffed over what they saw as the British media’s faltering attempts to locate Georgia on the map or provide context. A report on the news network ITV said that Shepherd was hiding “in a Russian republic of Georgia,” words that did not go over well in a country that went through fire and water to shed Russian rule. In its coverage of the Shepherd story, British tabloid The Sun essentially put Georgia in Central Asia by describing next-door neighbor Armenia as the “Silicon Valley of Central Asia.” Others used the “ex-Soviet” adjective, a label that peeves many, well, ex-Soviet people, who see it as outmoded and demeaning.